The galaxy NGC 3079 contains two "superbubbles" that stretch for thousands of light years. Astronomers think these superbubbles were created by outbursts from a supermassive black hole or the winds from young stars. Chandra data reveals that the NGC 3079 galaxy contains an accelerator that can create particles over a hundred times more energetic than the Large Hadron Collider. 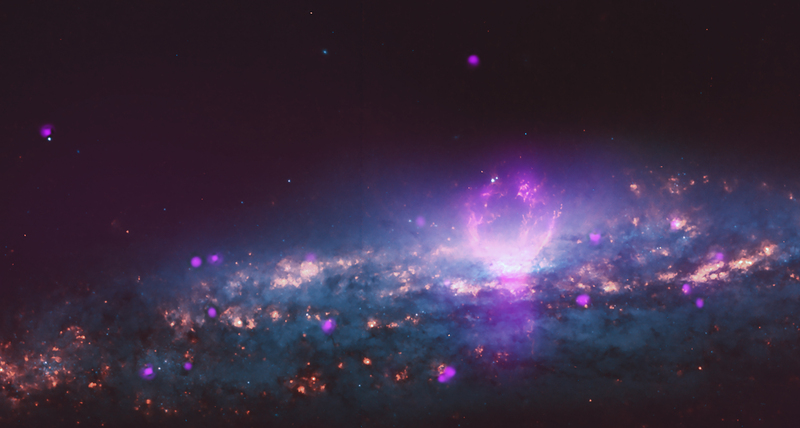 The superbubbles are seen in this composite image made from Chandra (purple and pink) and Hubble data (orange and blue). We all know bubbles from soapy baths or sodas. These bubbles of everyday experience on Earth are up to a few inches across, and consist of a thin film of liquid enclosing a small volume of air or other gas. In space, however, there are very different bubbles — composed of a lighter gas inside a heavier one — and they can be huge. The galaxy NGC 3079, located about 67 million light years from Earth, contains two "superbubbles" unlike anything here on our planet. A pair of balloon-like regions stretch out on opposite sides of the center of the galaxy: one is 4,900 light years across and the other is only slightly smaller, with a diameter of about 3,600 light years. For context, one light year is about 6 trillion miles, or 9 trillion kilometers. The superbubbles in NGC 3079 give off light in the form of X-ray, optical and radio emission, making them detectable by NASA telescopes. In this composite image, X-ray data from NASA's Chandra X-ray Observatory are shown in purple and optical data from NASA's Hubble Space Telescope are shown in orange and blue. 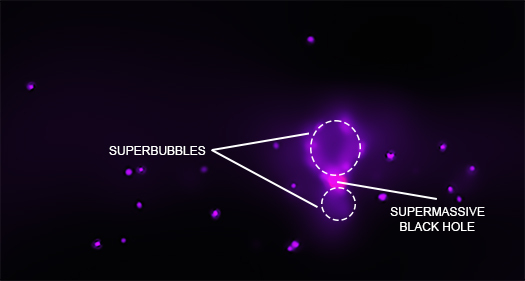 A labeled version of the X-ray image shows that the upper superbubble is clearly visible, along with hints of fainter emission from the lower superbubble. Credit: NASA/CXC/University of Michigan/J-T Li et al. New observations from Chandra show that in NGC 3079 a cosmic particle accelerator is producing ultra-energetic particles in the rims of the superbubbles. These particles can be much more energetic than those created by Europe's Large Hadron Collider (LHC), the world's most powerful human-made particle accelerator. The superbubbles in NGC 3079 provide evidence that they and structures like them may be the source of high-energy particles called "cosmic rays" that regularly bombard the Earth. Shock waves — akin to sonic booms caused by supersonic planes — associated with exploding stars can accelerate particles up to energies about 100 times larger than those generated in the LHC, but astronomers are uncertain about where even more energetic cosmic rays come from. This new result suggests superbubbles may be one source of these ultra-energetic cosmic rays. The outer regions of the bubbles generate shock waves as they expand and collide with surrounding gas. Scientists think charged particles scatter or bounce off tangled magnetic fields in these shock waves, much like balls rebounding off bumpers in a pinball machine. When the particles cross the shock front they are accelerated, as if they received a kick from a pinball machine's flipper. These energetic particles can escape and some may eventually strike the Earth's atmosphere in the form of cosmic rays. The amount of radio waves or X-rays at different wavelengths, or "spectra," of one of the bubbles suggest that the source of the emission is electrons spiraling around magnetic field lines, and radiating by a process called synchrotron radiation. This is the first direct evidence of synchrotron radiation in high energy X-rays from a galaxy-sized superbubble, and it tells scientists about the maximum energies that the electrons have attained. It is not understood why synchrotron emission is detected from only one of the bubbles. The radio and X-ray spectra, along with the location of the X-ray emission along the rims of the bubbles, imply that the particles responsible for the X-ray emission must have been accelerated in the shock waves there, because they would have lost too much energy while being transported from the center of the galaxy. NGC 3079's superbubbles are younger cousins of "Fermi bubbles," first located in the Milky Way galaxy in 2010. Astronomers think such superbubbles may form when processes associated with matter falling into a supermassive black hole in the center of galaxy, which leads to the release of enormous amounts of energy in the form of particles and magnetic fields. Superbubbles may also be sculpted by winds flowing from a large number of young, massive stars. A paper describing these results was led by Jiangtao Li of the University of Michigan and appears in The Astrophysical Journal. It is also available online. NASA's Marshall Space Flight Center in Huntsville, Alabama, manages the Chandra program for NASA's Science Mission Directorate in Washington. The Smithsonian Astrophysical Observatory in Cambridge, Massachusetts, controls Chandra's science and flight operations. Scale Image is 3.2 arcmin (about 62,000 light years) across. Coordinates (J2000) RA 10h 01m 57.8s | Dec +55° 40´ 47.2"
A pair of superbubbles stretching out on opposite sides of the center of the galaxy. About 67 million light years from Earth. Combines X-rays from Chandra X-ray Observatory and optical data from Hubble. About 62,000 light years across. X-rays are purple and pink. Optical is red and blue. In the constellation Ursa Major.